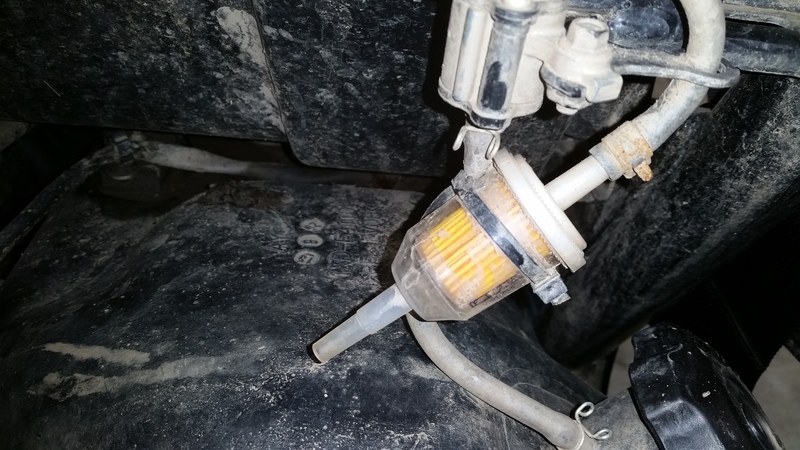 If anyone remembers the thread a long time ago about the extra fuel filter that a lot of people installed on the gas tank vent to kill the gas fumes and dirt from entering the tank through the tank vent.. Here is the great news after 600 checked that little filter and it was totally clean meaning it did its job perfectly as well as killing those fumes in the cab. So good job whoever came up with the idea and posted it. Welcome. Thanks for reminding me. I need to check mine. It's been awhile and I've been through some really deep water and lots of dust. I am looking at little filters for this purpose. Does anyone know what size fuel line it is so i get the right size filter connection. ? It looks like thee eights line in the pictures. I haven't removed my panel yet,but it seems like a great preventative measure. This is what I put on mine. Thanks i found one and it fit. But could this affect the float in the rank because it doesn't stay on full now even though its full? No, this should have no affect on that, you have something else going on there. I double checked the service manual. This machine uses a generic float with a potentiometer to vary resistance based on fuel level. You could in theory, seal and pressurize the tank and the float would still function. If they had used a differential pressure meter, tank pressure would indeed make a difference in the reading, but they do not, so it sounds to me like you have a "stuck" float switch. That or you may have knocked loose the electrical connection while you were working in that area? Check out the service manual it tells you how to check it all. Last edited by FordTruckMan; 05-24-2016 at 05:54 AM. Thanks to who ever came up with this fuel tank filter idea, I have noticed the fuel smell for awhile now and it is annoying, just p/u one of those filters and will install it my next days off....thx again! Okay thanks ill check the manual and open panel back up to inspect connection.